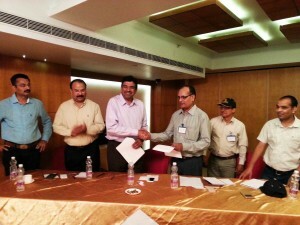 A Memorandum of Understanding (MoU) was signed between the National Seed Association of India (NSAI) and Seed Entrepreneurs Association of Nepal (SEAN) on 3 June 2015, to foster better future collaboration between seed companies from both countries, during visit of Nepalese seed entrepreneurs’ delegation to India. NSAI, which is the apex organization representing the seed industry in India and SEAN, the apex organization representing individual entrepreneurs and companies engaged in the seed industry in Nepal, have agreed to share country-specific seed industry information including market development, government policies and regulations and information on trade. The MoU will help create an enabling environment for increased trade and knowledge sharing between governmental agencies and research institutions, for joint development and release of seeds in both countries and to harmonize seed policies and seed certification procedures. Both associations will also work together to promote and exchange new varieties, promote production, processing and marketing of high quality seeds by the private seed entrepreneurs and to facilitate increased participation of the private sector in import and export of seeds. 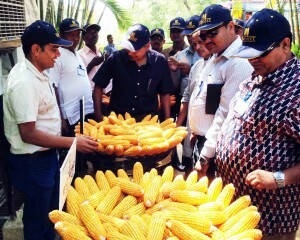 Participants compare cob size of different hybrid maize varieties at Bioseed company in Hyderabad. According to Arun Joshi, Country Liaison Officer, CIMMYT Nepal, Nepalese seed enterprises are in their initial growth phase. They are constrained by the lack of research and development component, low business volume, limited seed processing and storage facilities and low seed capital. CSISA Nepal (CSISA-NP) has recently initiated a business mentoring initiative to build the capacity of small and medium seed enterprises engaged in wheat and maize based systems. A team of experts of CSISA-NP assessed the potential and challenges of Nepalese seed enterprises and established a good relationship with them through a series of interactions. “After the assessment, 15 Nepalese cereal seed production entrepreneurs representing hills and Terai (plains) were identified for a 10-day exposure visit to India,” highlighted Dilli KC, Monitoring and Evaluation Specialist, CIMMYT Nepal. During the visit, the Nepalese group observed many components of Indian seed business including research and development programs, seed processing facilities and government farms at four major seed enterprise centers – Delhi, Kashipur, Hyderabad and Elluru. The entrepreneurs received first-hand information on ways to link contract farmers with private companies, how to set-up backward linkages for hybrid seed production, the process of enhancing maize seed germination through cob drying facility and marketing. “We have to establish demos of our products and maintain good relations with seed producers and consumers,” said entrepreneur Tikaram Rijal, Managing Director, GATE Nepal. The participants also understood how smaller seed companies that work with open-pollinated varieties maintain seed quality and market their brand. “R&D activity should be promoted even in open-pollinated seeds for our growth and sustainability,” highlighted one of the participants, Subhas Upadhaya, Chairperson, Lumbini Company. The Indian private sector shared insights on strategies they had adopted to manage challenges during their growth period and showed willingness to help build the capacity of the Nepalese seed enterprises through internships, short-term trainings and collaborative research. “The exposure visit and the interactions with Indian seed companies helped them to realize the importance of having a clear strategy both for SEAN and their individual businesses in order to be more successful,” added Joshi. According to McDonald, CSISA-NP will continue to strengthen its collaboration with seed enterprises and will guide them in developing their business plans.